How To Get FREE Real Time NSE Data For Amibroker? This tutorial will teach you to get FREE real time NSE data for Amibroker. We have now found a small piece of software (about 1.5 MB) that can get you real time NSE data for Amibroker. This software (Data Feeder) is freeware and you can use it as long as you wish, you can have stocks list up-to 100 stocks ( you can add more but slows down real time NSE data for Amibroker). So now you don’t have to pay any subscription charges to other data providers, we have tested this software for a long time and did not see any issue with the data. Moreover, you can see Sensex, Nifty and USD-INR currency pair price. This small app has the feature of backfilling data of 1 day, 5 days and EOD data as well, You can download this software from the link at the end of the post. Download Data Feeder from the link at the end of the post. Install using setup.exe, at this step you ate done with the installation. Now let us setup database in Amibroker, Run/open Amibroker. Type the name of database, select base time interval as: 1 Minute and click Create. Select filtering as Show day session only. In trading hours, for day Session enter start as 09:15 and end as 15:30, Click on OK.
Now you have successfully configured real time NSE data for Amibroker. Now run Data Feeder from the desktop for the first time. Here you will need to create a list of stocks that you need under real time NSE data for Amibroker. Once you are done with adding stocks, press the red button named “Amibroker is not connected click here to connect” once you click this button it will become green. Now click on “ADD STOCKS” button to add stocks to your Amibroker watch list. Let’s perform some Back-fill, click on “Backfill-1M Data” to get 1 day intraday data of selected stocks. Select chart refresh rate to “5 Seconds“. Now we are ready to hit that START button. Now real time data should be loading perfectly. A special trick: This free real time NSE data for Amibroker is from Yahoo Finance. And we have seen that Yahoo prints the first bar’s high and low abnormal. This makes the look of your chart distorted. We have found a solution to this problem. Change the start time as 09:16 instead of 09:15 in Amibroker’s database settings. 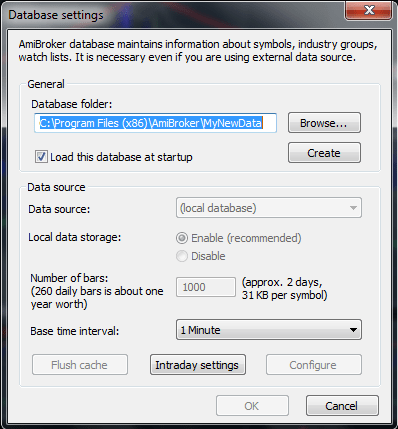 I am trying to download the Data feeder software for amibroker , but when clicking on the data feeder given at the end of your post as mentioned by you, data feeder download option is not seen. Pls help, from where to download ??? Yash, let me check and fix. Check back in couple of days. Where is the download link..
Could you please help me in finding the download link??? Sorry guys. The download link is fixed now. Working now. Plz, check back. Unlock the download link using any of the social share buttons. Kumar, no it’s not possible. It is a free version. It’s an old utility, I have not checked how its working nowadays. If you test it, do give me a feedback. Naveen, this software is now discontinued by the developers. You need to manage with the trial version OR you can shift to software like AmiFeed. Babu, this is an old post. This was working great till last year. Now Google has stopped intraday data utility support. Where from can i download amibroker software?